Do you know someone who has been naughty this year? 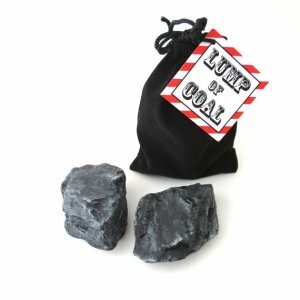 Give them these realistic looking lumps of coal to deliver the message! Each black velveteen bag contains two peppermint scented "coal" soaps brushed with mica. The perfect stocking stuffer! This product contains no animal products and has not been tested on animals. Ingredients: Glycerin, Coconut Oil, Palm Oil, Sucrose, Propylene Glycol, Dionized Water, Tea Laurel Sulfate, Acetamide Mea, Cocaqmidopropyl Betain, Essential Oil, Fragrance, Activated Charcoal, Mica.